This blog discusses cruise ships, cruise news and what is happening in the related Beyondships.com website - a resource for people interested in ships and cruising which contains in-depth profiles of ships with photo tours, interviews with captains, menus, daily programs and deck plans. I have always liked Holland America Line's Eurodam and so I was quite pleased to find the ship performing so well when I cruised on her recently. Eurodam is a mid-sized ship. She is bigger than any of the other Holland America Line ships with the exception of her sister Nieu Amsterdam. However, at less than 90,000 gross tons, she is far smaller than most ships being built today. But that is how Holland America and its fans like it. They prefer the relative intimacy of smaller ships. The ships are refined with museum quality art and thoughtful décor. The atmosphere is sophisticated, reflecting the fact that the line attracts more educated passengers. This is not to say that Eurodam is tiny. She is large enough to have several specialty restaurants, a theater, a nightclub, a secondary entertainment lounge as well as two pools and a sizeable spa. What she does not have is things like a water park. Her guests prefer things like the digital workshop or the culinary arts center. 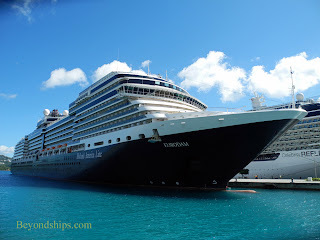 What really struck me about Eurodam, however, was the friendliness of the staff. This was not the type of friendliness that is part of an effort to get an extra tip. Rather, the people seemed to genuinely want the passengers to have a good time. In order to find out more about what Eurodam is all about, I spoke with Captain Jeron van Donselaar and Hotel Director Stan Kuppens. Both of these individuals were key players in bringing Eurodam into service in 2008. They have continued on with the ship subsequently although Mr. Kuppens left for awhile to bring Nieu Amsterdam into service. Thus, not only are they in a position to speak knowledgeably about the ship but they also yed key roles in forming the ship's personality. The Beyondships website is an online resource about ships and travel. In the cruise ship section, the object is to present information about the ships so that the reader can get a feel for the ship. To that end, there are photographs of the ships and their interiors, interviews with captains and cruise line executives, articles, copies of menus, daily programs, specialty restaurant reviews and deck plans as well as other information. In the cruise port section, we have photo reviews and information about ports to which cruise ships travel. There are also articles about shore excursions and experiences ashore.